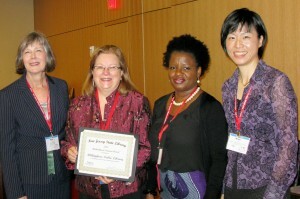 New Jersey State Librarian Mary Chute honored three New Jersey libraries for conducting outstanding multicultural programs to engage cultural and ethnic communities in meaningful and effective partnerships during a breakfast at the New Jersey Library Association Annual Conference, on June 4. Willingboro Public Library for their African Immigrants in New Jersey – A Celebration program. Each library received a $1000 award presented by Mimi Lee, Adult, Urban & Diversity Services Consultant for the NJ State Library. Ocean County Library: Valerie Bell, assistant director, Mary Chute, NJ State Librarian, Susan Quinn, director; Bahiyyah Abdullah, president of the Toms River Area NAACP; Judy Macaluso, supervising librarian branch services, Mimi Lee, Adult, Urban & Diversity Services Consultant. 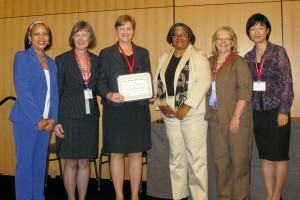 Willingboro Public Library: Mary Chute, NJ State Librarian, Christine Hill, acting director, Paulette Williams, program manager, Mimi Lee, Mimi Lee, Adult, Urban & Diversity Services Consultant.